Because all people have been created in the image of God the Creator, creativity and art are a part of being human. At BJU you’ll learn how art communicates, whether it’s telling a story, provoking emotion or thoughts, or simply existing as something beautiful for people to enjoy or use. At BJU you’ll learn how to use your creativity to reflect God’s as you produce art. You’ll use a wide variety of tools, from charcoal to oil to potter’s wheels, and you’ll learn how working as an artist is both fulfilling and God-glorifying when you have a right view of God and His creation. The foundational courses and overall philosophy of BJU’s studio art program were developed by Emery Bopp, one of the early professors in the Division of Art and Design. After earning a certificate from Pratt Institute, Bopp enrolled in the graphic design program at Yale University, where he became a member of the university’s first graduating graphic design class. At Yale he studied 2D design and color theory with Josef Albers, typography and printing with Alvin Eisenman, attended lectures on design by Alvin Lustig, and took a painting course from Willem de Kooning. The progressive teachings of these 20th century leaders in art and design that Bopp brought to BJU still resonate in the program today. A curriculum designed for your development as an artist. Beginning in foundational courses on art and art theory, you'll explore aesthetic theories, learn the principles and elements of composition, study 2D design and color theory, and survey a wide range of available artistic media. As you continue through the program, you’ll develop concepts that are unique to your artistic vision as you realize your personal artistic voice. You’ll find that you gravitate toward certain media and concepts, and you’ll use these preferences to build a body of work that will be the starting point for your professional practice as an artist. Authentic studio experience. Each course has two parts: classroom instruction and studio work. Whether you’re taking Drawing & Structural Representation or Printmaking or Advanced Painting, you’ll create work in every course. And regardless of which medium you find your best expression in, you’ll use the concepts you’ve learned in the classroom to sharpen your skills and techniques in the studio. At the end of the program you’ll exhibit your work and learn how to put on future exhibitions as you grow as an artist. The start of a journey. The making of art is a life-long pursuit. Your choice to study studio art reflects your love of creating, your appreciation of aesthetics, and your recognition of the unique power that the visual has in communicating eloquently and influencing culture. At BJU you’ll learn artistic expression from a biblical worldview and explore your own talents and interests in art as you understand yourself better. You’ll learn how to apply Scripture and your biblical worldview to all of life, even to situations where you’ll evaluate and interact with the contemporary visual arts culture. By the end of your program of study, you’ll be equipped to take on a wide variety of artistic pursuits and to continue learning throughout your lifetime, glorifying the Creator with the talents and growth He has blessed you with. As an artist, you’ll need skills to connect with people from a variety of backgrounds and to communicate effectively with them. That’s one of the reasons you’ll take the BJU Core—another is to give you a broad base of knowledge to draw from for your inspiration. Courses like history, math and philosophy will provide you with a rich stream of ideas and equip you to be a better thinker and problem solver. You’ll take courses in English and communication that will help you build rapport with patrons and fellow artists. In addition, your Bible courses will connect your relationship with God to all of life—such as being a good artist and having good ethics and integrity for God’s glory. You’ll learn how what you believe affects everything you do, including creating art, and how you can use your creativity to reflect the One who made you. 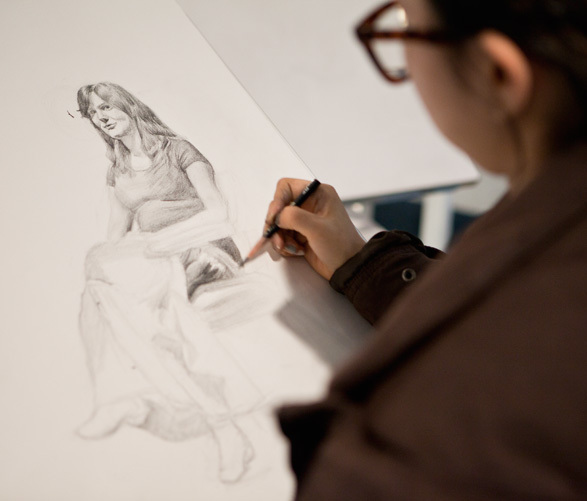 The studio art program has 22 credits of art electives, so you have some flexibility with your program. You can focus on a couple of areas or experiment with various kinds of art and take a variety of courses, from watercolor to illustration to printmaking. Your academic advisor will work with you to help you choose the courses that are best for you. I learned how to move into new materials without fear at BJU. My family instilled the work ethic; the art department showed me how to make something with that. Oddly enough, it was the operas that sparked a hunger in me for culture, and my exposure to literature at home and at BJU also pushed me. The Museum & Gallery was a wealth of new riches for me. There was so much to get interested in. I still want to learn—which I feel is indispensable for an interesting life. I am surrounded by the unsaved. I think God intends to change some of them. It’s my job, in obedience and love to not get in the way of that. My life needs to look like I am aware that I was rescued from a worse place than my unsaved friends. I was worse: I had been given the truth all my life, but lived as if I hadn’t. I participate as a group leader in an independent Bible study, Prasso (a Greek word that means to practice), that helped set me free. Christians are not always sure how to get to what hurts—being an artist has helped deal with sorrow frankly and with transparency. It’s the language many of us, as creative types, speak anyway. Having that speech redeemed with the rest of me has proven to be refreshing. It will set you free to live as Christ intended, as an artist who gives the entire gift back. Your degree in studio art culminates in creating a cohesive body of work and exhibiting it in a group art exhibition during your senior year—it’s a great opportunity to display and sell your work. There are many art exhibits each school year, so you can enjoy work from your peers, faculty and guest artists. The Sargent Art Building provides you with great workspaces and two exhibition corridors for art exhibits. Studios for drawing, sculpting, fiber arts, ceramics, and more—complete with essential tools, such as artist easels and raku kilns—are available for class and after hours for you to use. In addition, you’ll have access to the computer lab, which comes equipped with more than a dozen iMacs that provide access to the Adobe suite. What’s more, the exhibition corridors are regularly updated with artwork of current students, graduates and faculty so you can learn from, enjoy and be inspired by other artists’ work. Each year juniors and seniors in the art program have the opportunity to travel to New York City; Washington, D.C.; or Chicago on an educational tour. The destination depends on the year: trips to New York City are every other year, and trips to Washington, D.C.; and Chicago alternate the in-between years. On these trips you’ll visit famous museums and exhibits, including the Museum of Biblical Art; the Cooper Hewitt, Smithsonian Design Museum; The Guggenheim; The Museum of Modern Art; The Met; the Smithsonian; the Hirshhorn Museum; the Art Institute of Chicago; other special exhibits; and the studios of individual designers and artists in these centers of design. BJU’s studio art faculty are all working artists who create and exhibit work on their own. 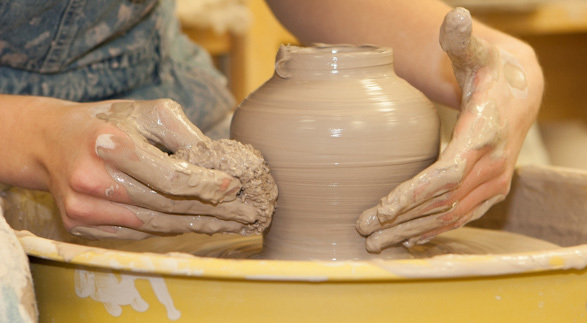 They recognize the value of personal instruction, so they keep class sizes smaller and make an effort to get to know you individually so they can tailor your art education to your unique style and favorite subjects. Create original and successful works of art in a variety of media and techniques. Analyze and synthesize the major achievements of the greater art community from the past to the present. Evaluate quality and effectiveness in their own work and the work of others. Organize and execute an exhibition of their own work and the work of others. Employ the language of visual art to communicate on a professional level.